The chum salmon (Oncorhynchus keta) salmon are also known as "dog" salmon because of the spawning males' large canine teeth. Chum weigh an average of 10 pounds. But, larger fish up to 14 pounds are not uncommon on the coast. Although often overlooked by many anglers, Chum are aggressive, hard fighters, and great sport on a fly rod. 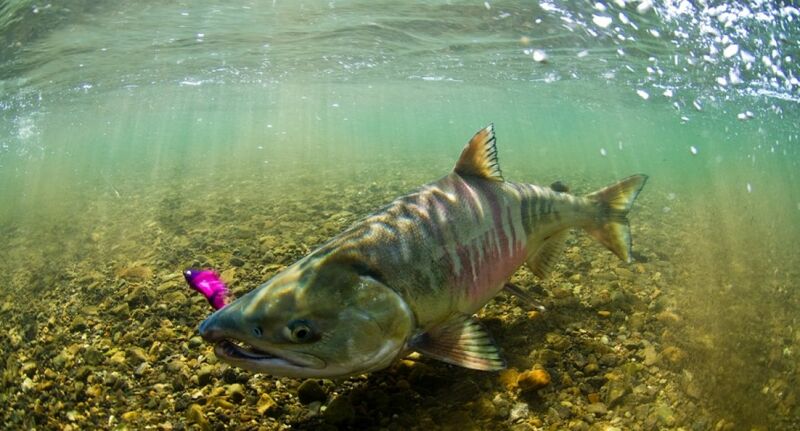 Chum salmon start their migration in mid-June and continue to run into early August, and you will even still catch fresh chums occasionally in late August! These great Alaska salmon insure that no matter what month of the summer you come to Alaska there will be fresh salmon somewhere. There fighting ability is often compared to that of a large brown trout. Meaning they stay down and dirty through the entire fight. Being the second largest salmon, falling short only to the Chinook salmon. These brutes use their massive body weight to their full advantage. Of all the places we catch chum or dog salmon, the ______ river is no doubt the “ace in the hole” for great sea-lice Alaska salmon fishing. Being able to ‘sight wade fish’ in fine sand and gravel is always a highlight to the week of fishing. The fairly small and intimate size of ______ river allows anglers of ALL mobility to walk/wade fish or simply stay in the boat and cast to large pods of chrome salmon at your rod tip with ease! There is another interesting impact that Chum salmon have on our area fisheries. It’s that of creating the first major food source of the year for the resident sport fish of Alaska. By dropping millions of eggs into the river system, the Rainbow Trout, Dolly Vardon, Arctic Char, and Arctic Grayling scoff up these tasty treats as fast as they can. Then making them vulnerable to the fly angler. Soon after spawning has occurred the impressive tonnage of dead fish carcasses also adds to the local wildlife and resident fish diets. Come to our Alaska fishing lodge for Chum salmon, one of the finest freshwater sportfish in Alaska!